When I was a child horses allowed me to be bigger, stronger, and faster than I was on my own two feet. They swept me into a world where anything was possible. They shared their journey through time and space with me and lent me a sense of power in life. 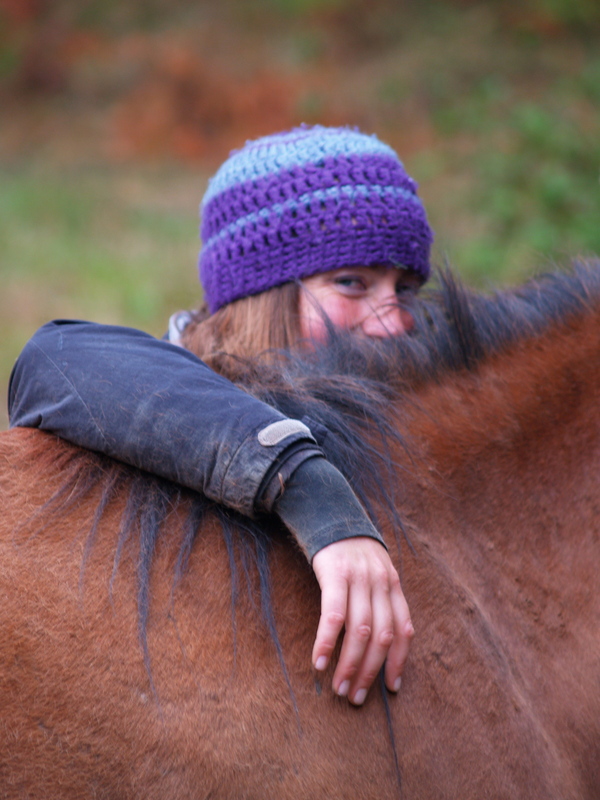 To this day, horses still give me all of that and so much more. In the beginning horses were a physical thrill and that physical thrill fed me mentally and emotionally. 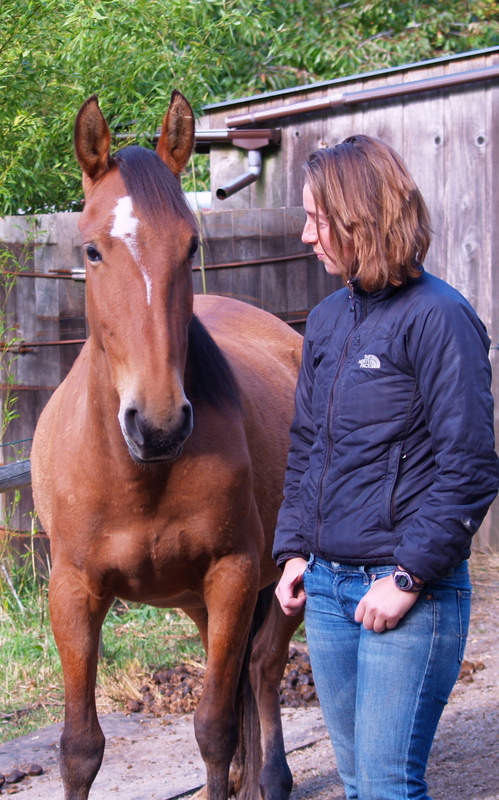 As I grew, training horses became a mental thrill, learning about cause and effect, building a partnership between horse and rider systematically. Now in this project, challenging me to a year of training without tools, I find my emotions are being fed directly in a way I have never before experienced. I sit here watching the print course along the page as I struggle to illustrate with words this visceral and personal experience. I am not sure how it is this project seems to use my mind and my body to shape the course of events while tapping more directly into the emotions at the core of my existence. 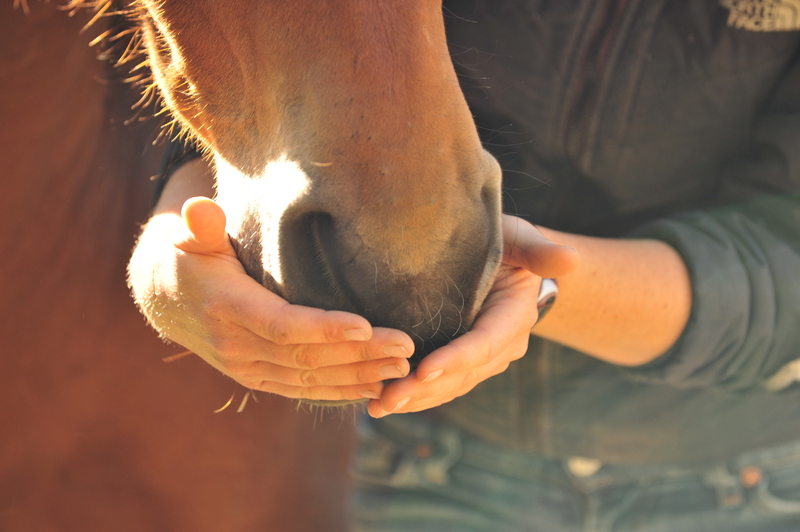 I can tell you the physical steps I take, I can tell you the mental processes that accompany the physical steps, yet I don’t know how to describe the emotional component that comes from the connection between horse and human. I do know, however intangible it is to explain, people feel it powerfully when they get the chance. Perhaps not exactly what I feel, but something profound none the less. Each time I introduce someone new to the Mustangs, I am apprehensive that what I do is too subtle and slow to be of interest to anyone other than myself. 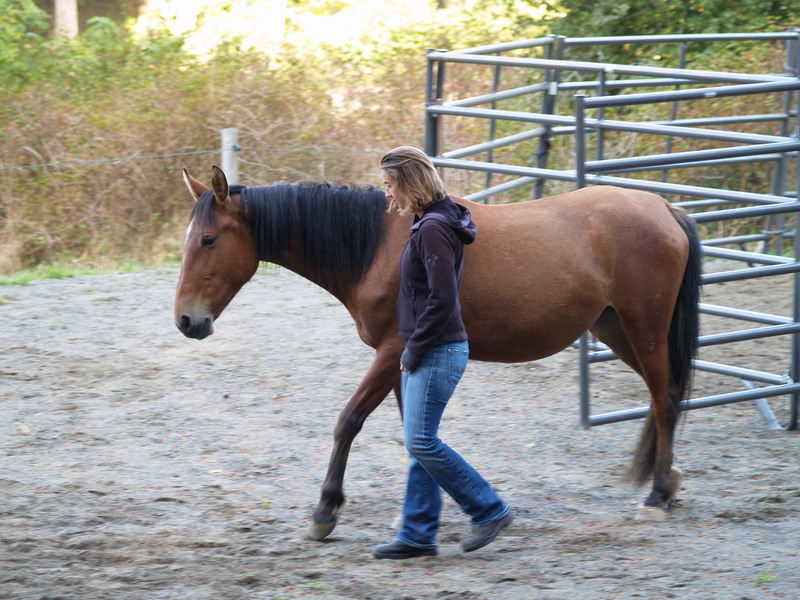 Nothing ventured nothing gained, so I take a deep breath and put it out there, walking each person who comes to visit through the physical steps of drive and draw, approach and retreat, walking them through the mental understanding of building trust and connection with a horse. 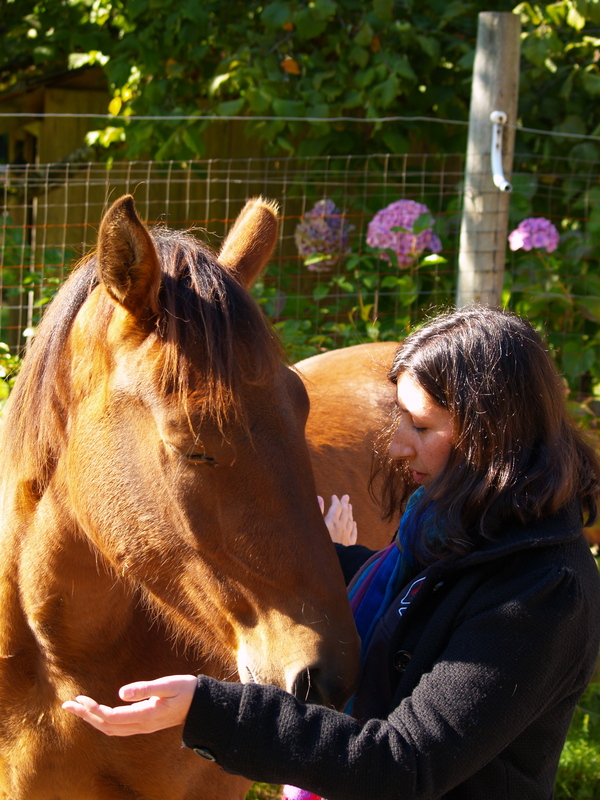 Then I stand back and marvel as the emotional connection between horse and human sparks and all of a sudden this isn’t just about me and my journey with Myrnah. This is a journey shared. I don’t know how to explain the feeling of intensity, being an integral part of a horse’s breakthrough from fear to confidence. I don’t know how to explain how time evaporates and before we know it, hours have gone by in the blink of an eye. I don’t know why it is so emotionally touching to feel that bond, that trust and that connection with an animal so recently wild and so new to the world of people. I marvel that I can share this experience with other people. Myrnah and Cleo are willing to reach out to the friends I bring to visit with them, willing to meet, converse, and show each person attention and devotion, offering communication and connection. It’s so simple and so powerful. 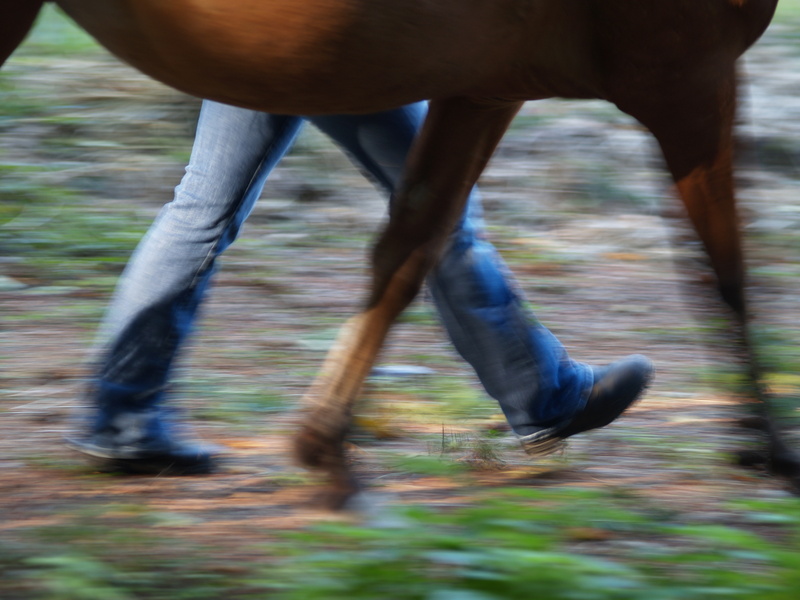 I know I could spend more time with the Mustangs drilling cues and specific responses, riding patterns and creating machine-like perfection of movement. I also know that doesn’t affect anyone in the deep way this more inexplicable feeling of connection does. I sat on Myrnah again on Monday- it was lovely and yet somehow also felt beside the point. 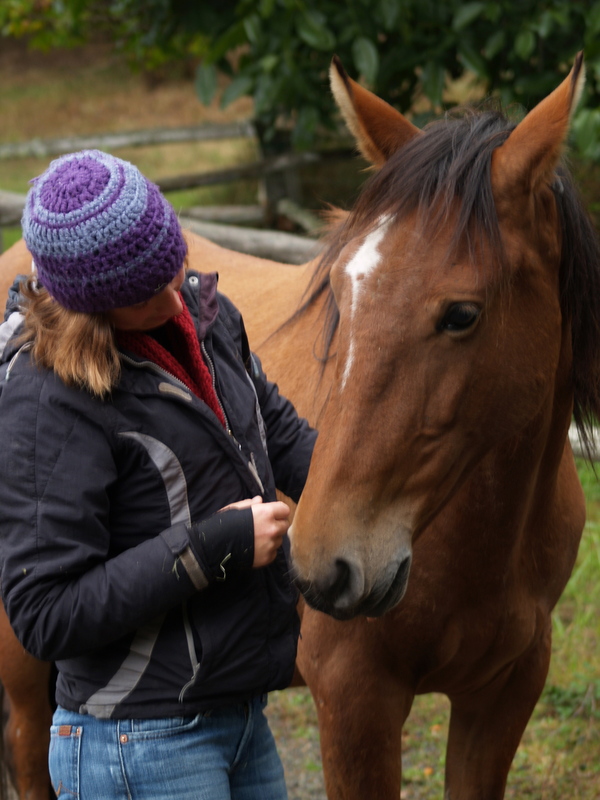 It felt like Myrnah was unconcerned but also unengaged as though there may be a few more things we need to do before she is ready to completely bond and connect with me riding. This isn’t about how many tasks we can do together; it is more about how engaged and interested I can encourage Myrnah to be about doing those tasks with me. It’s about how the two of us feel as we do whatever we are going to do together. Myrnah and I are sharing this journey with each other, and also with the world. To anyone who might be interested in tasting this inexplicable feeling of connection, I want to put it out there that it is possible, and achievable, and simpler than you might expect. You just need to learn to read the signs along the way. As life with Myrnah seems to be, this week was both unassuming and life changing all at the same time. Long story short: I took my first ride on Myrnah and I am flying high about this next step in the journey. The details are more modest and quiet than the headline would lead you to believe. I love that dichotomy of quiet unassuming details gathering together for results that seem bigger than the sum of their parts. Tuesday morning Margaret was here to do some filming for me. Myrnah and I went through our routine of grooming, basic yielding, and walking together. We went out the gate of the paddock into the woods to explore, and, when she found the bucket with a little bit of hay in it, I noticed there was a rock right next to us. It wasn’t planned, it just made sense to step up on it and belly over her back while she nibbled bits of hay. This moment in itself is monumental because, as recently as a week ago, Myrnah would have been irritated with me for distracting her from eating. Tuesday Myrnah didn’t mind at all. I got off and on several times- just bellied over, my full weight on her for far longer than ever before. 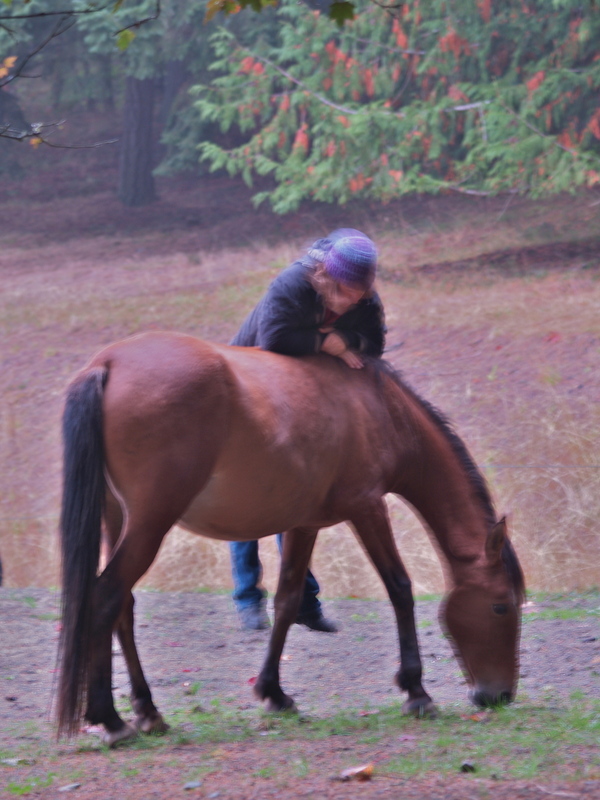 Myrnah stayed unconcerned, so I threw a leg over her back and used the rock to push me up astride. One leg on either side, I laid on her neck, relaxed, peaceful, feeling her breath, listening to her chew, watching carefully for any signs she might like me to get off. After awhile I decided I had pushed far enough into new experiences and got off to resume my more customary position next to her. When she finished eating, Myrnah took me on far more exploration of the woods than ever before. Showing confidence and exuberance, she sometimes picked up the trot and let me run alongside her, seemingly just for the joy of doing so. We were out for hour more or less, before she took me back to the gate, then to the trailer letting me know she had had enough exploration and would like to go have breakfast. I like this routine we have created. At some point we will take this pattern and apply it to traveling to other places to explore. Myrnah loves the trailer as it is where she gets to eat the rich, Eastern-Washington hay. One of these mornings, when we feel ready, I will let her in the trailer, close the door, and take her somewhere new to explore together- somewhere fenced where she can’t get in trouble with traffic or danger, yet somewhere that isn’t home. 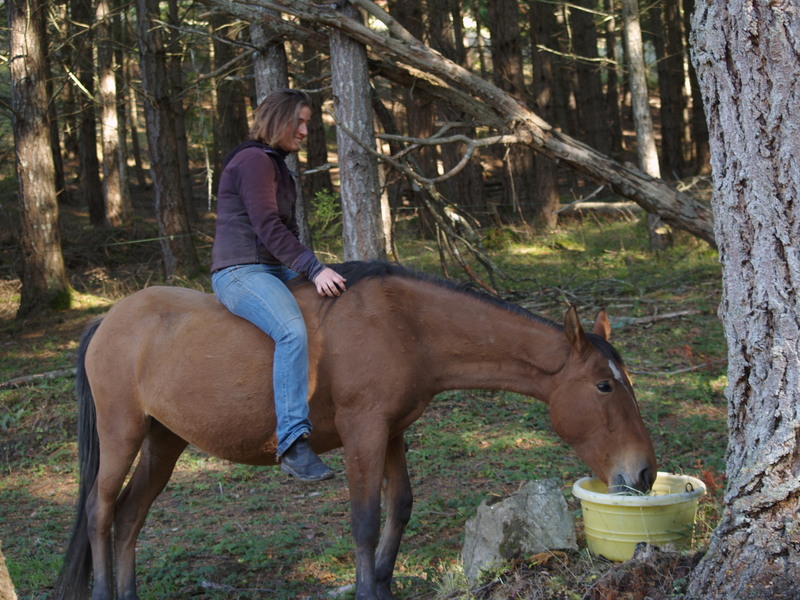 We will travel around side by side or riding and explore the world, returning to the trailer for the remainder of breakfast whenever she is ready, and make the return trip home. Until then we will continue exploring more parts of the woods close to home, continue developing her confidence carrying me, and continue honing her trust to let me direct her speed and direction with increasing accuracy. Beyond the simple dictates of essential training I have begun to widen Myrnah and Cleo’s social context, expanding their trust in humans beyond myself, and giving a few wonderful friends the chance to walk through the steps of earning trust and feeling connection with recently wild horses. I also put a new horse in with them for the first time this week. 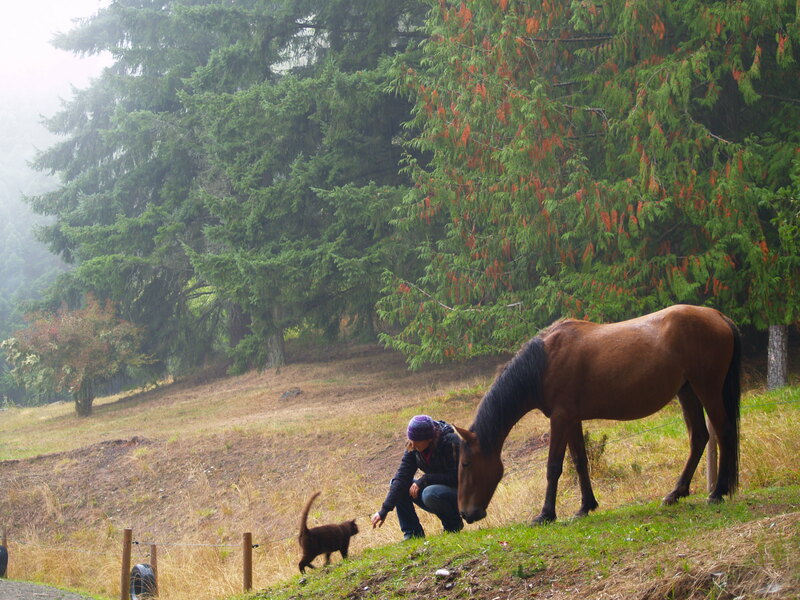 Lir, a two-year-old Gypsy horse was a perfect first domestic companion for them to know, even-tempered, respectful, and easygoing even in the presence of horses less so. I was there with them for the first few hours, sending Cleo or Myrnah away from Lir and me when they showed any aggression, allowing them to be close with us when they remained polite. 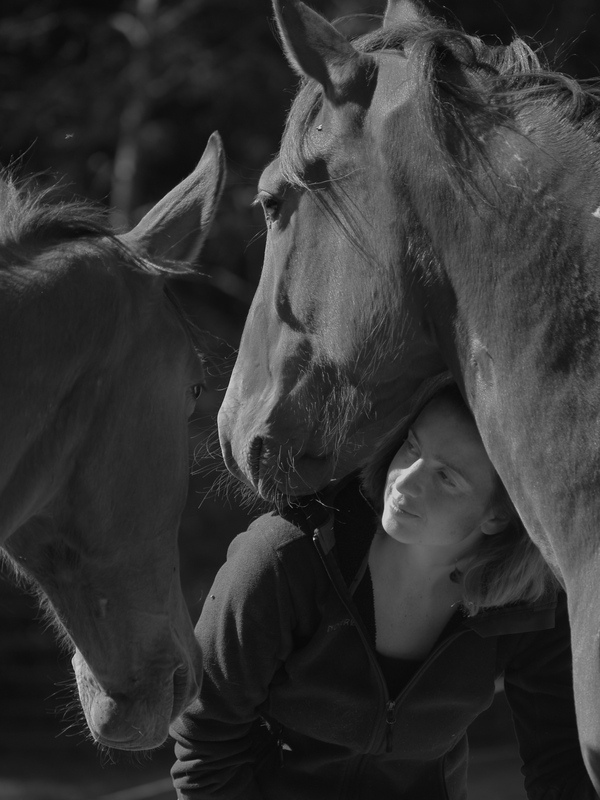 I understand horses will work things out as they need to in a herd; I also need them to understand that aggression has no place anywhere around people. When people are present all communication needs to remain polite. Cleo seemed to understand me completely right away. I only saw her coil for one kick at Lir. I sent her away and after that she was the model of civility when I was around. Even when I was on the other side of the paddock she might be standing next to Lir, reach out to touch him, and then look over to me quickly to make sure I was OK with that, then reach out again commencing a game of touching each other with their noses- a game that looked surprisingly similar to the games I play accustoming Cleo to being touched by me. Myrnah was not so convinced Lir was a good addition. Time and again she would approach and then pin her ears, bare her teeth, and charge. When I was there, I would send her away. She would move a few feet off, look at me and then walk to a different spot in the paddock, as though she hadn’t a care in the world. I know she ran Lir around the paddocks some when I wasn’t there to enforce civility, but after a few days they had formed some sort of truce and would pass each other like two ships in the night, carefully avoiding aggravating each other. Lir left on Monday to go to his other home on Orcas. The Mustangs are again on their own for a little while. Soon another companion will come up for them to get to know as winter is fast approaching and dry spaces to live are in high demand here. 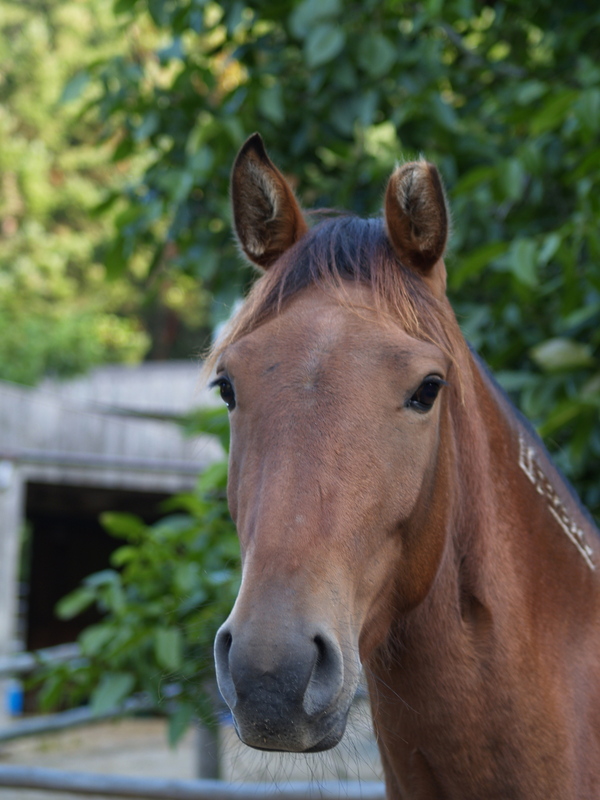 Hopefully, by the time spring is on the horizon, before the foal is imminent, Myrnah and Cleo will be out in a pasture bonding with the larger family of horses who will be family to the new little one. I don’t know what it is about mile stones that makes me want to look ahead in anticipation of future mile stones. 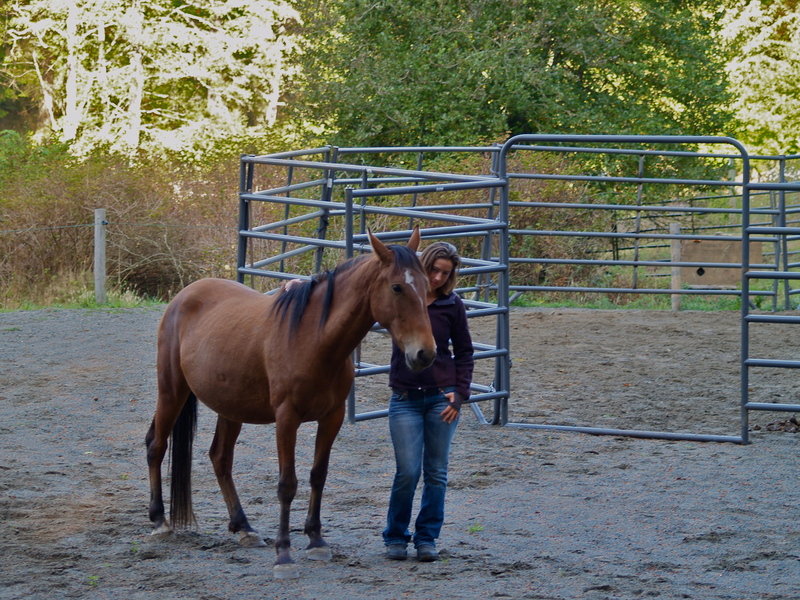 First ride on Myrnah this week, just ten weeks from being wild on the range. When the other miles stones will fall into place only time will tell. The beautiful thing about training Myrnah as I am, using no tools of force, is my illusions of control are limited right from the start. I recognize that I cannot control her any more than I do at any given moment because I have no tools to force her to obedience. Whatever leadership I have in this partnership I have to earn. If she is not willing to give me control of her direction or speed, I have to break the training down to the simplest pieces, developing her trust enough that she feels content to have me in the leadership role. If I walk through this relationship knowing she has full right to take back control of her speed and direction at any time two things happen: One, I take care to develop strong habitual patterns of her following my leadership, never challenging her so much that she loses trust. Two, I am less likely to be scared of losing control when I accept I only deserve whatever control she feels safe enough to give me. I can’t be afraid of losing something I know is only on loan so long as she trusts me. 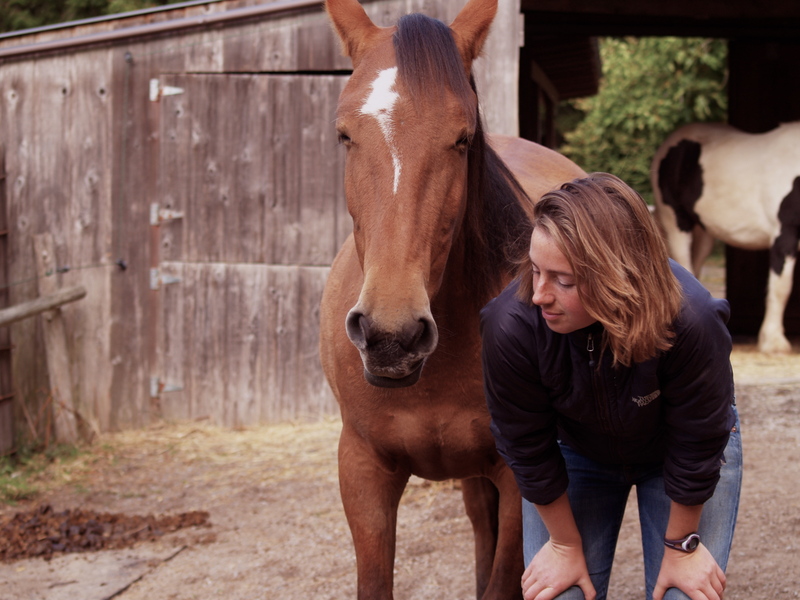 Without tools to force Myrnah into situations she would choose to avoid, I believe we will ultimately feel more reliably and consistently safe than the usual horse and rider partnership. Before we take that walk out into the woods, both of us have to agree it is a good idea. Once we have agreed, there is less likelihood that fear will interrupt our progress. 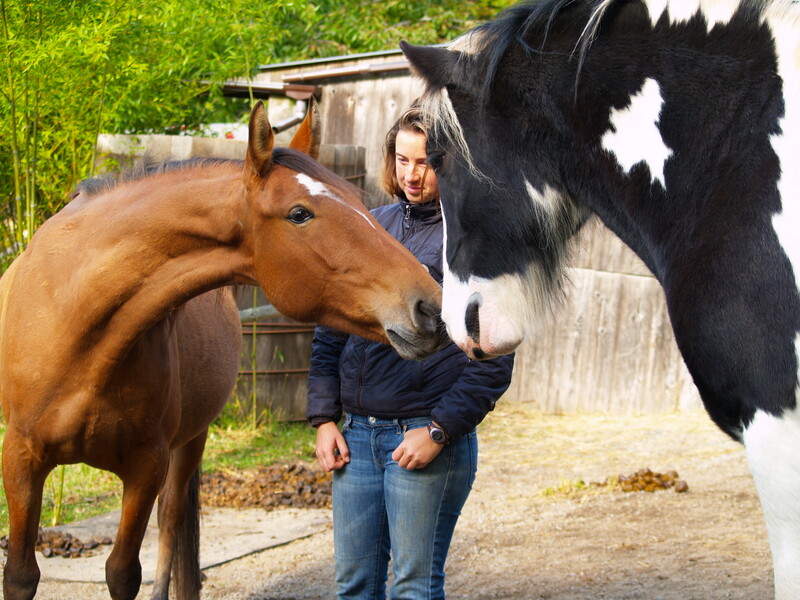 From my observations, both people and horses get into trouble when they think they deserve to have more control of a situation than they actually have. As a rider I expect to be able to go, stop and turn my horse, at any time. A horse often thinks pretty much the same thing about their rider. 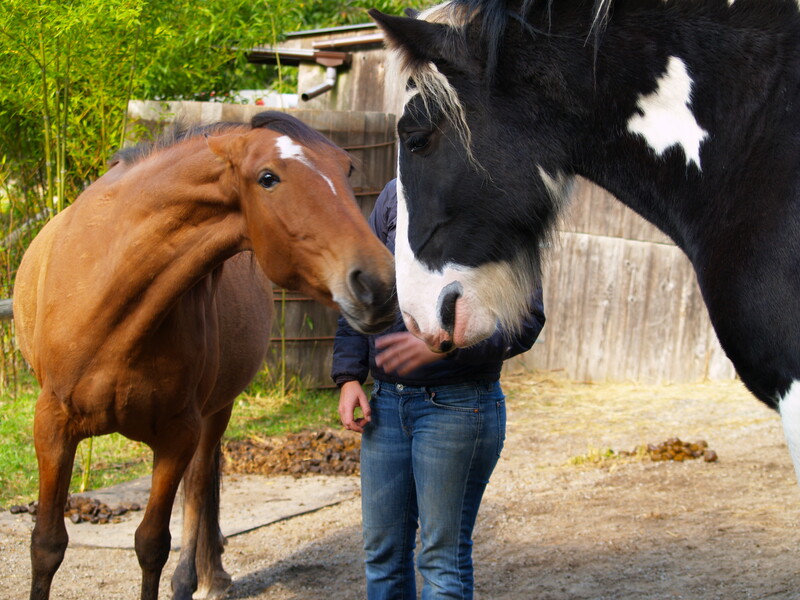 The art of training a horse, develops the horses desire to be part of a team. 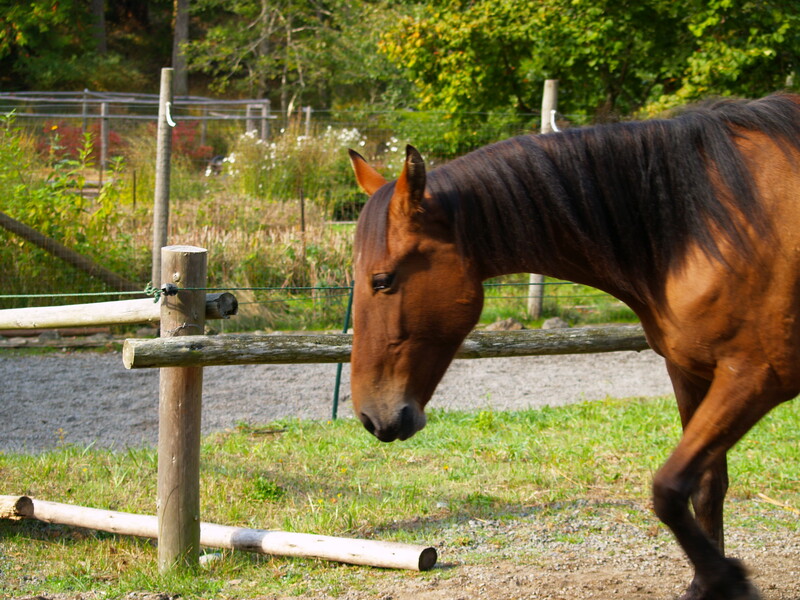 Horses need to learn to give up their control without fear of being unsafe. 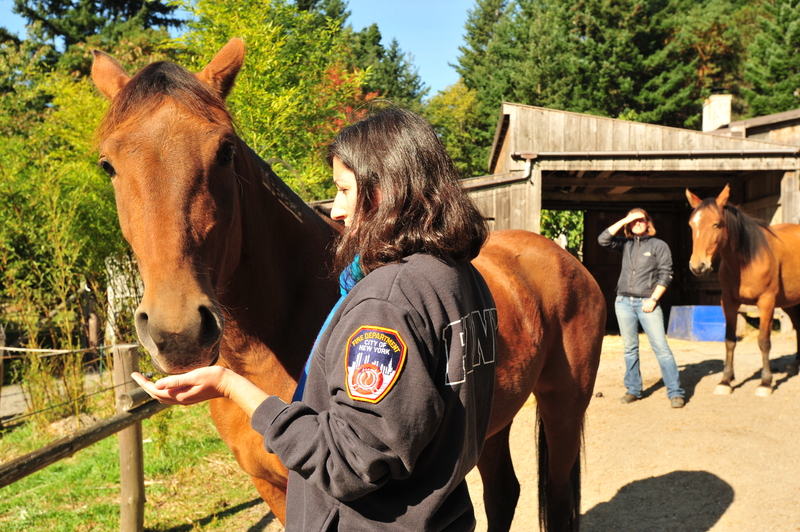 People need to learn to develop control of the horse without causing fear in either their horse or themselves. As soon as fear steps into the game rationality starts fading away. If I give up my control of a situation, will I still be safe? Will I get hurt? Can I trust someone else to make the decisions for me in this situation? If I think anything bad might happen, there is no way I want to give up my control of speed and direction, neither does the horse. We are at an impasse, using more and more force to try to gain enough control in the partnership to feel safe. So last week I wrote about what Myrnah and I do when we reach an impasse. I am happy to report it is going beautifully. Little by little she is allowing me more and more control of speed and direction on our walks through the woods. She is once again willing to put up with the boredom of having her feet handled and trimmed, trusting me to get through it and move on to something more fun soon. That trust is something we have to keep building and honing to a useful point. Myrnah has to trust me that boredom and claustrophobia don’t last forever, she has to trust me that I will have more interesting things to do with her after tasks that are tedious, she has to trust me to take her away from food and know I will bring her back to food again soon. That last one is probably the hardest lesson we have together. Coming from a place of being pregnant where food was scarce it is hard for her to trust me there will always be enough even if she can’t consume it right away. Yet proving that to her again and again I feel is a powerful tool to bond us together. Myrnah and I are making such simple slow and steady progress I find I am amazed to think we may be ready to ride sometime in the next few weeks. 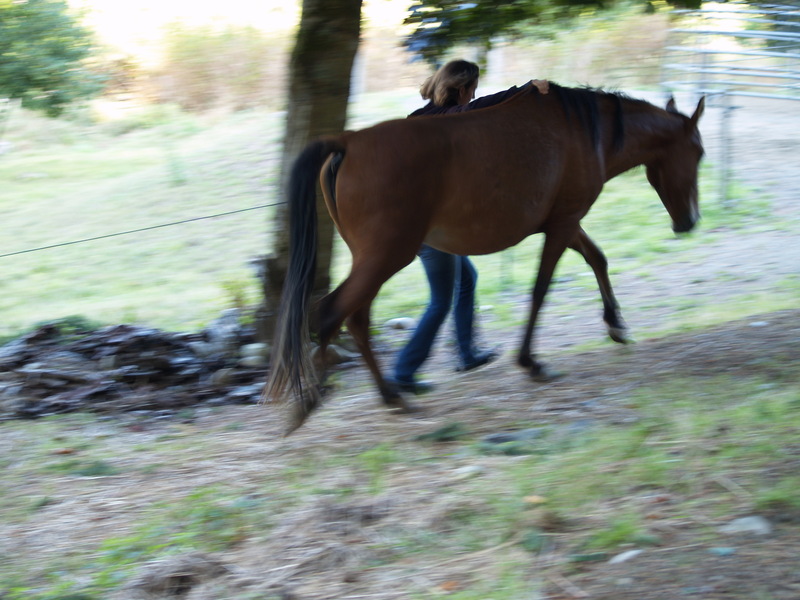 Her back is starting to look more muscled, and she trusts me enough to let me jump up with my arms braced on the other side of her withers, holding myself there, feet hanging a foot off the ground for a few seconds before I slide back down to earth. 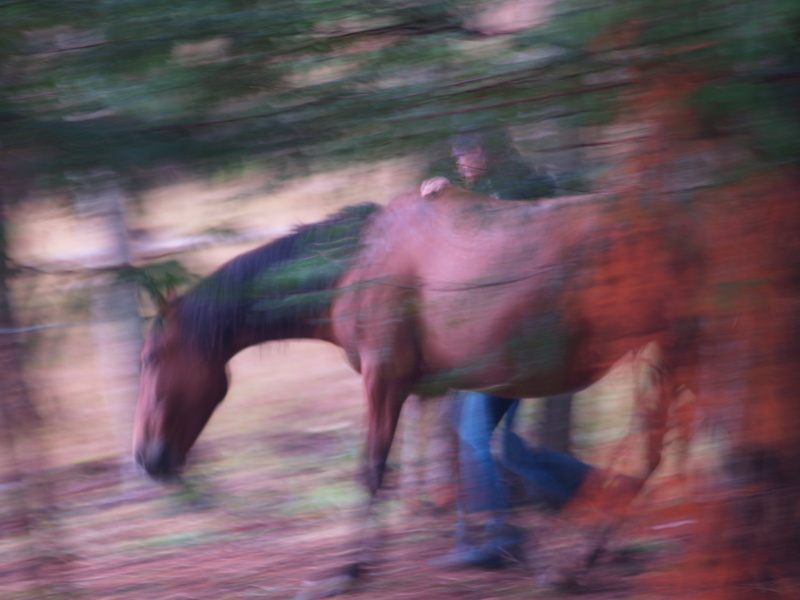 I dream of galloping flat out with Myrnah through the pastures, baby alongside us, her trust in me allowing enough control that we both feel safe. I don’t know how long it will take to build that sort of relationship, but I do know I want to find out. 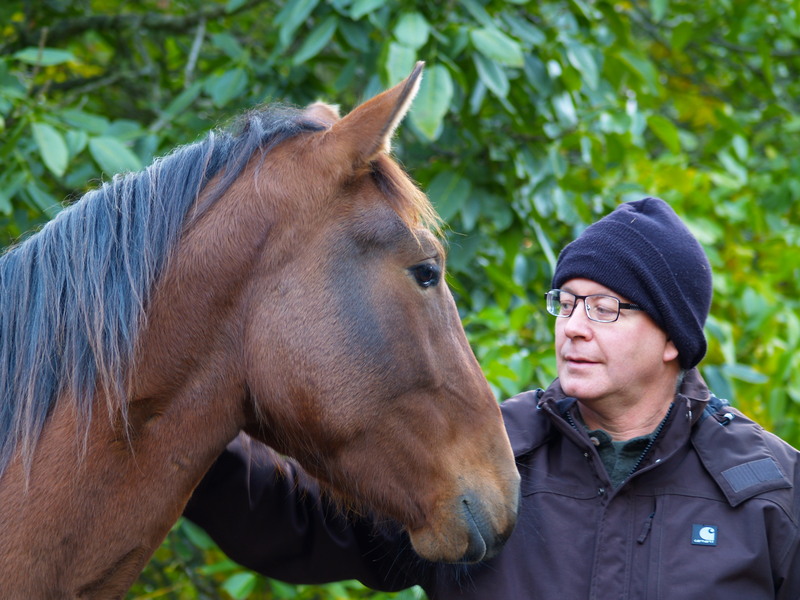 One Horse, One Trainer, One Year, No Tools, how far can we get? Is it possible for us to train together without fear of losing control? This week Myrnah got confident. Confident enough to say no to me. That makes me smile, and also check my watch. These dialogs take time. When a horse tells me no in response to a request, I can do one of three things: I can make their life uncomfortable until I get a yes, or I can just look for where the yes naturally is, working gracefully back to my original request from a better perspective, or some combination of those ideas. Myrnah and I started the week taking walks together outside the paddock. Beyond the high fenced area is a larger woods paddock fenced only by a single strand of dark green electric fence. The feeling of freedom is enhanced by the lack of visual fencing. Yet I have enough confidence in Myrnah’s respect for that electric line to know we will not wander too far astray in these first forays outside. Myrnah hesitated at the narrow gate. Once outside, I put my hand on her withers and shadowed her movements, the two of us exploring the world together, side by side. There were little bits of grass to nibble and terrain to be investigated. The only limits I set were about the grass directly under the hot wire. She needed to adjust to my directing her at least a small amount of the time, and because I didn’t want her getting shocked by accident, those seemed like good spots to put off limits. When we got close to the fence I would use my hand on the side of her neck to turn her around as much as it took to head her away from the fence again. Interestingly, once there were a few spots off limits, those were the only places she wanted to go. When I had her faced away from the fence, she would say no, she didn’t want to walk in that direction. So I looked for the yes. In this case, the yes was standing quietly, my arm draped over her back, my ribs against hers breathing softly together. It could be seen as a standoff; it could also be seen as an opportunity to practice being together, being still, being patient. 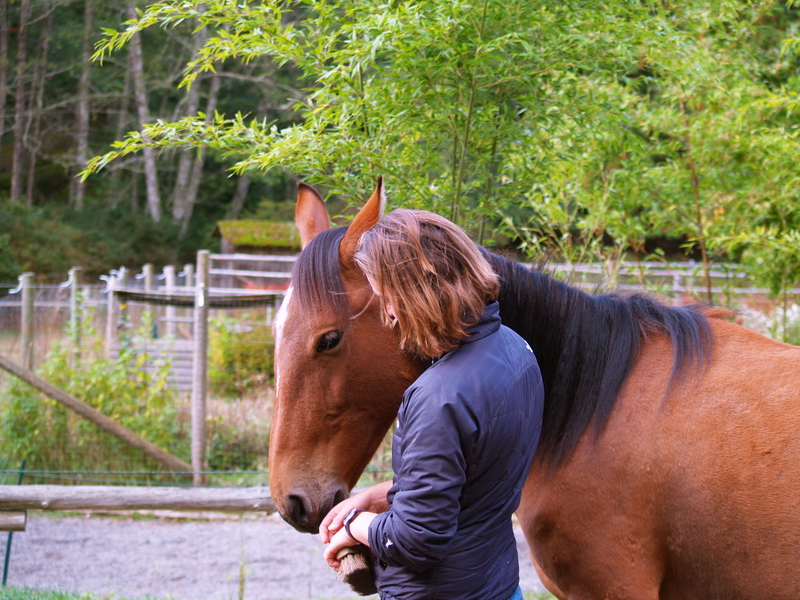 There are many times I would like my horse to be still and patient while I talk to a friend, or teach a lesson, or fix a piece of broken fence. If Myrnah wanted to practice that in this particular moment, I was prepared revel in the yes, while thinking about how to change the no gracefully in the future. The next time out, Myrnah was slightly more exploratory, but after forty-five minutes got stuck in a battle of wills with me about the grass under the electric fence again. If I wasn’t going to let her eat under the fence, she wasn’t going to take me exploring around the woods anymore either. We again took the opportunity to practice stillness and patience for a while, finishing our time together by letting her follow me back into the main paddock and into the trailer for her breakfast hay. The following day I put a bucket with a few bites of timothy hay out in the woods for her to find in her explorations and I stuck a few brushes in my pocket. The bucket was fun for her to find as she was worried about it being in a strange place, and then she was happy finding she liked eating what was inside. When we would reach an impasse where she didn’t want to explore, and I wouldn’t let her graze the spot she wanted, the yes we could agree on was being still together, only this time I added grooming to our still times. It was a great session… except for the end when I thought I would ask her to take me back into the paddock with me at her withers instead of me walking ahead of her. Myrnah said no, she liked being the one to pick the direction of travel when I was walking at her side. I can tell her where she is NOT going, letting her decide where she IS going from the array of other choices. However, our relationship is not evolved enough for me to tell her where we are going specifically, unless I am actually in front. So in this particular instance I settled for being able to tell her which direction to face, then, after an appropriate amount of time being still and enjoying each other’s company, I took the lead and let her follow me back into the paddock. It’s nice to know we have skills to fall back on, when the new skills are still in their developmental infancy. So Myrnah decided all these exploratory walks were the new fun game. When I went to trim her hooves on Tuesday she again said no. 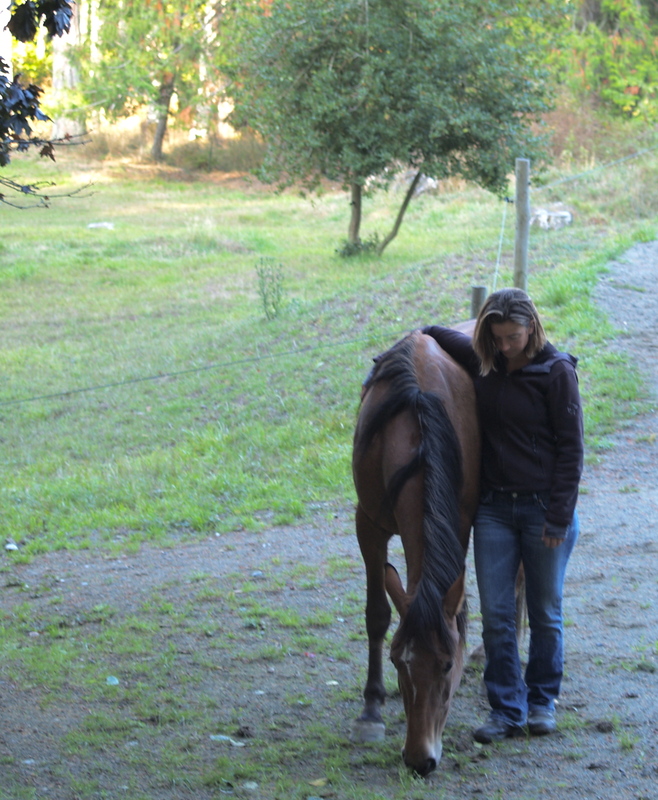 Every time I ran a hand down her leg she started walking away, taking me to the gate, patiently letting me know she didn’t want to do hooves anymore- she just wanted to go out walking. Again I looked for the yes. If she wanted to walk, me too, walking together is an excellent game to practice. We didn’t take it out the gate, just in random patterns through the paddock- practicing turning and walking over and over until she offered a stop. When she did I would run my hand down her leg and we were off again. 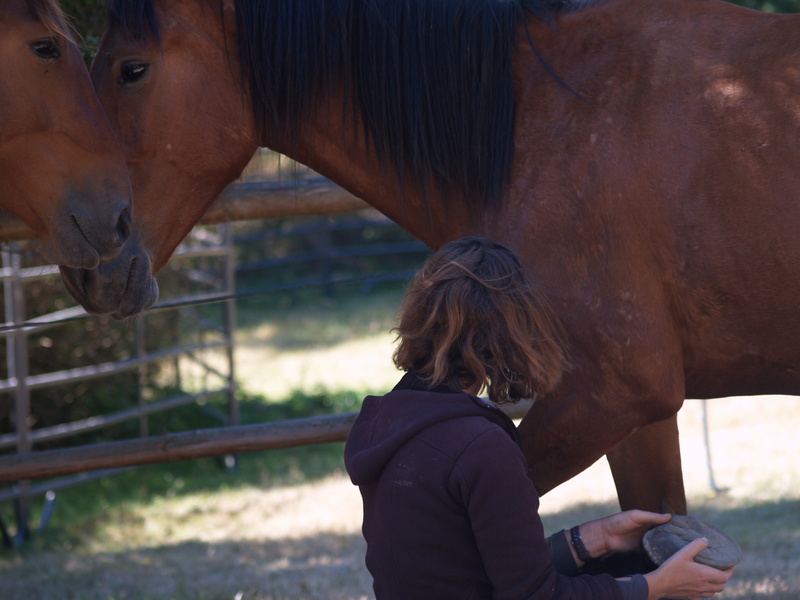 Forty-five minutes later she heaved a sigh and stood still and patient for me to trim all four feet. It takes time, but it’s worth it when I feel her make the decision to work with me, not because she has to, just because she has decided life is better this way. Luckily I still had time to take her outside the paddock after her hoof trim to end our session with the explorations she seems to be enjoying so. Interestingly, Cleo is also letting me trim her front hooves with no halter or lead on, much more readily and quietly than Myrnah this week. It’s kind of nice to have them switch roles, with Cleo being easy and Myrnah making me work for the relationship this week. They keep me thinking and I like that. Wherever there is a No, there has to be a Yes nearby.